Animals which pose the incessant urge to prepare a home for their offsprings are referred to as nesting animals. Nesting is a behaviour displayed by some animals during pregnancy where they portray instincts caused by the increase of the hormone estradiol E2, to prepare a home for their new offspring. The characteristic is present in insects such as the wasp, hornet and bee, birds like the swallows, owlsand hummingbirds. Even in mammals including the squirrel, alligator and mice. Animals perform their different form of preparations to create the most comfortable conditions for both their offspring and themselves during hatching or childbirth.However, some of these animals nestle themselves in our homes and sheds. This has proven to be a big challenge for many. While the porch may be a little more visible, a lot of people don’t notice if a squirrel, snake, raccoon, or other animal build a home underneath a shed.By the time one discovers it, the process of eliminating them is too gruelling. This is also because the creatures are entrenched in their new spot. Therefore, it could take some work to get them out. Furthermore, insects like bees and wasps are known to pose a danger as they sting anyone who disturbs their habitats. Animals like squirrels and mice may eat into stored food supplies and garden produce which contaminates human food supplies. These among many others are the reasons it is requisite to keep these animals from creating shelters in your sheds. Rats and mice will eagerly set up a basecamp in your shed if you’re giving them with a steady supply of food. Rodents and insects will always make a meal of any edible material around. It is therefore mandatory that all potential sources of food and water are effectively eliminated. Disposal of garbage in properly sealed garbage cans is another measure that ensures there are no sources of food for these animals.It’s very imperative to keep birdseed, pet food or anything similar in sealed airtight containers to help keep them from sniffing it out. Fix leaky pipes and remove standing water, as water can attract mice and insects and provide breeding grounds. If you intend to plant a garden, consider designing it so that it remains a safe distance from your shed or garage. Often undetected for weeks or months at a time, birds can build cozy new homes in sheds and garages year-round when you least expect them. Birds, though pleasant are known to make quite a mess too. Bird droppings are known to leave unpleasant stains on surfaces. These have always proven troubling to rid. This calls for avian control methods. A common effective way is netting. Netting can be placed in eaves and other areas of sheds such as windows to prevent birds from gaining entry. Such means ensure sheds remain undisturbed from birds and some flying insects. Dirt is considered an attractive feature to rodents and insects. Mice and Roaches will always find a meal from such particles. If left unattended to, dirty sheds can attract several animals and insects, which are always problematic to alienate. It is therefore important to clean up sheds on a regular basis to ensure no dirt particles are left behind as a food source for these animals and insects. It is also vital to treat sheds with medication to repel pests and rodents which pose a great challenge to the upkeep of sheds. Checking sheds regularly for infestation is imperative as it is a consistent measure that ensures one keeps insects and animals away. 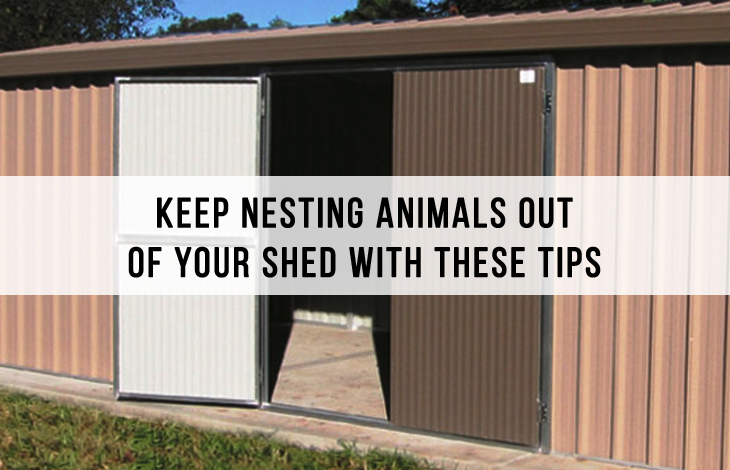 If you have a shed whether a garden shed or a pet shelter, be sure to follow up on the measures to keep nesting animals away.